Objectif (s) : To strengthen the resilience of populations to climate change and improve food security. Activités : •Built 39 market gardening wells and rehabilitated a total land area of 9.75 ha for market gardening production around the wells. •Provided training to local communities on water management and improved production techniques (off season market gardening, compost techniques, land management, etc.). •Built three boulis to facilitate irrigation and rehabilitated a land area of 1 ha for market gardening and rice production around each bouli. 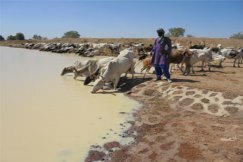 •Built four pastoral wells enabling access to drinking water for an estimated 2 400 heads of cattle. •Built 27 boreholes enabling access to drinking water for an estimated 16 200 heads of cattle. •Held a workshop with about 40 participants on project results and lessons learned. Partenaires : The technical services of the Ministries of Agriculture, Food Security, as well as Animal and Water Resources and Non-governmental Organizations.